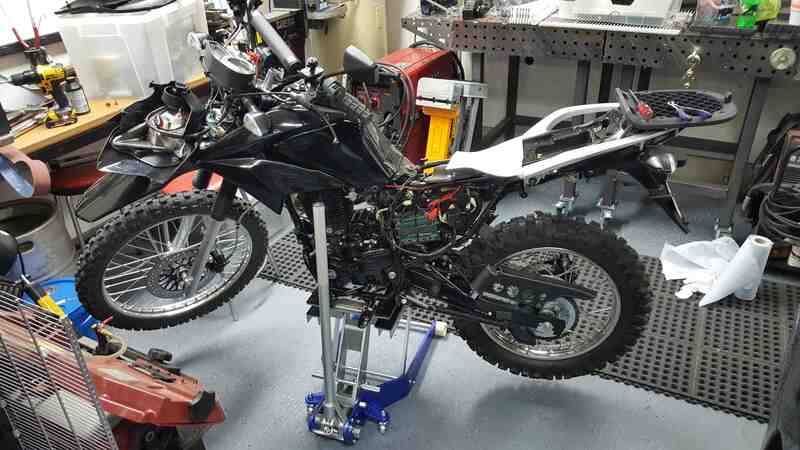 June 10, 2016 By John P.
If you own an ATV or a motorcycle, and you ever want to do any kind of routine maintenance or work on it, eventually you’re going to need some kind of a lift to get it safely off the ground. Especially if you intend to work on wheels, chains, brakes, or similar components. In that case, you’ve got a few options. There are small dirt bike stands, and if you have a lightweight bike you can just drag it up onto one. They’re super cheap and portable. If you have a heavier bike, you could opt for a manual hydraulic lift, like the one being reviewed here. If you have a super heavy bike, you could go for heavy duty flatbed lift. But they are large, and expensive. 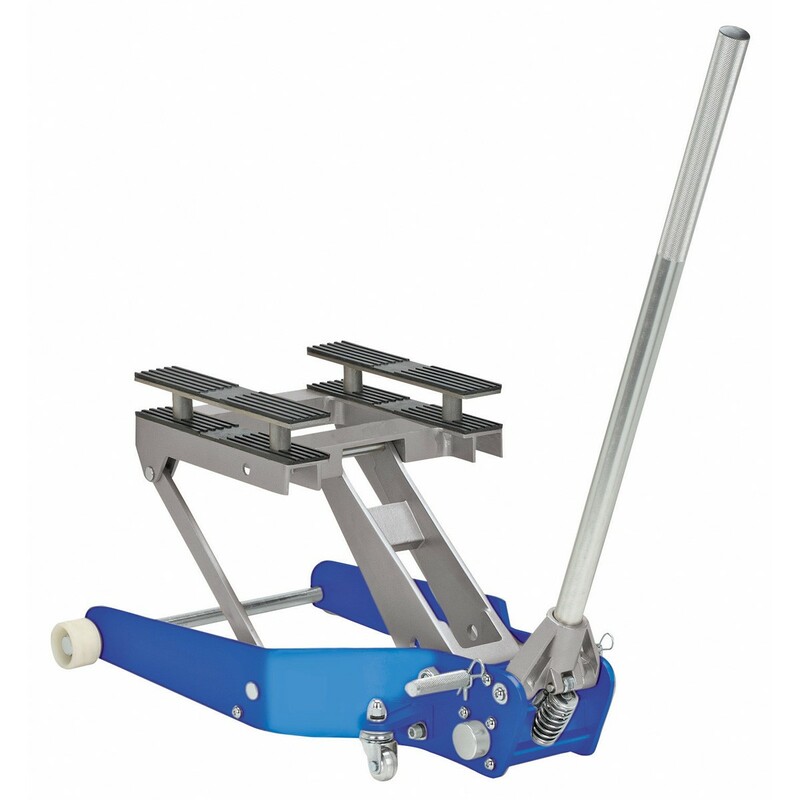 I considered a number of units, such as the Motorcycle Lift Lightweight Aluminum (by CENTRAL HYDRAULICS) on Amazon for $200 shipped, and the Liftmaster 1500LB Motorcycle Bike Lift ATV Jack 11cm low profile for $95. But eventually I decided to grab a 20% off coupon and stop by Harbor Freight for their 1,500 lb. ATV/Motorcycle lift. They had one on display, and it looked surprisingly quite solid and well made, so I brought one home for about $160. The Harbor Freight model appears to be the EXACT same thing as the one and only aluminum model offered on Amazon, and at $200 shipped they even cost the same – except for the fact you can get those coupons for Harbor Freight. And the Liftmaster unit is steel, not aluminum. So the weight differential is noticeable – 60+ pounds vs 47, plus it only raises to 14″ vs 19″ and there appear to be other quality differences. Just not worth saving the $60 in my opinion. A few years ago I stopped shopping at Harbor Freight altogether. The thing is, a lot of their products are super cheap, but at the end of the day I would replace them with a name brand unit and it would always perform better. Eventually I decided to just buy the good one off the bat, and gave up Harbor Freight. So I don’t know what it says about the world when the good one actually comes from Harbor Freight! Because this jack is indeed a good one. First of all, you can’t beat the simplicity. There is a one piece handle, that is easily removable. You insert it into a receiver, where it locks into a little pin which you turn left to release the hydraulic pressure, or right to tighten it up to hold the pressure while you work the jack. There is also a little screw which you can tighten to keep the handle in the jack, even if you want to pull a motorcycle around on it by the handle! Or just loosen the screw to remove the handle while you get up under the bike to work. Speaking of getting up under it. The last thing you want is to jack up a heavy motorcycle and have the jack fail on you. So there are a couple of holes in the arms that appear when the unit is fully raised, and a bar slips right through for safety in case of hydraulic failure. The only way the bike is coming down with that bar in there is if you knock it off. Which lets face it, is a possibility. Unlike a heavy duty lift, you can’t exactly strap the bike to it for stability. But I can say that my 260 pound Hawk was on the lift while I basically tore it apart from front to rear, and although it wiggles around a little bit, there was never a concern that it was going to fall down. So, the bottom line is – If you have a lot of space and budget isn’t an issue, get a heavy duty foot powered lift! 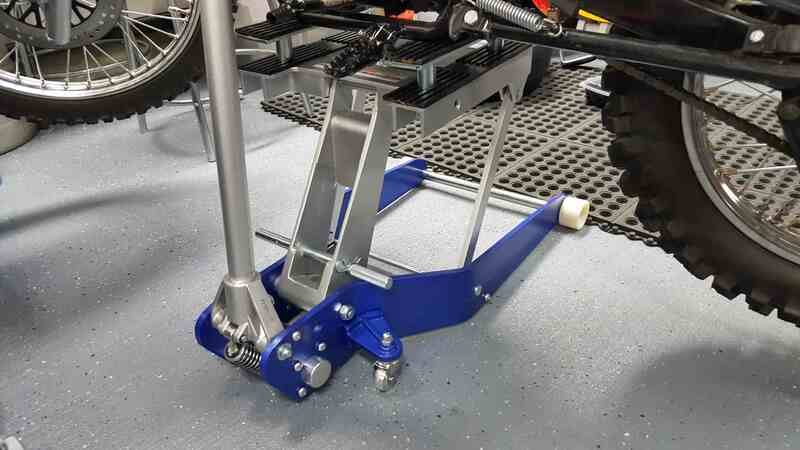 But if you need something portable, or that generally doesn’t cost too much or take up a lot of room, the Aluminum Harbor Freight ATV / Motorcycle lift will do just fine!